Please refer to our stock # cet1 when inquiring. This unusual necklace was made by the Italian design duo of Lyda Toppo and Bruno Coppola, better known as Coppola e Toppo. The necklace has a wearable length of 16" and is 1 1/4" wide in front. 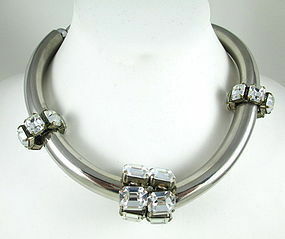 It is made from curved chrome plated sections with woven rhinestone accents between each section. It has an adjustable choke chain and the hook closure is hallmarked "CoppolaToppo". It is in excellent condition and comes from one of the last periods of design with this great firm.